Yup, sry for the delay, I’ve had a lot of work recently. I have prepared three demos and a publishable (but far from perfect and not yet documented) class. The demos are FLA based… you can find the timeline code to assemble the demos at the bottom of the post. I’ll publish some documentation in the next days, so until then just look at the demos’ code to unserstand the basic of the class usage. 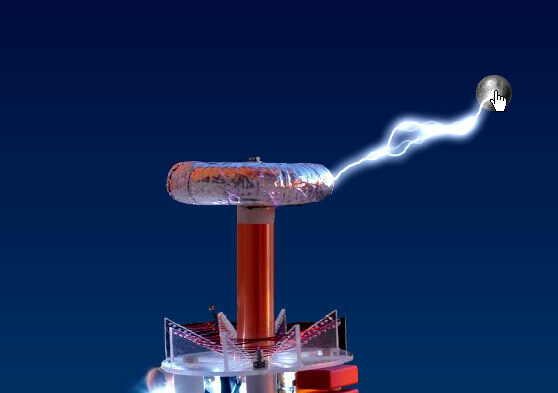 This demo shows the two different behaviours the class can mimic: Electric discharge/beam or lightning. Drag the ball near or far to the coil to see different behaviors. This demos show the maxLength and maxLengthVary properties in action. 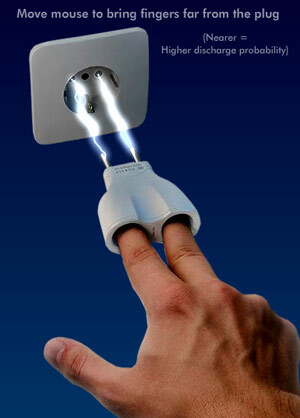 Bring the fingers near to the plug to have continuos electricity. Bringing the hand far from the plug lowers the discharge probability. Reaching the max distance simply disables it. A nice sandbox to play with (some of) the properties. The class is recursive to create children so many properties have also a decay twin property which rule how the property is passed to children. 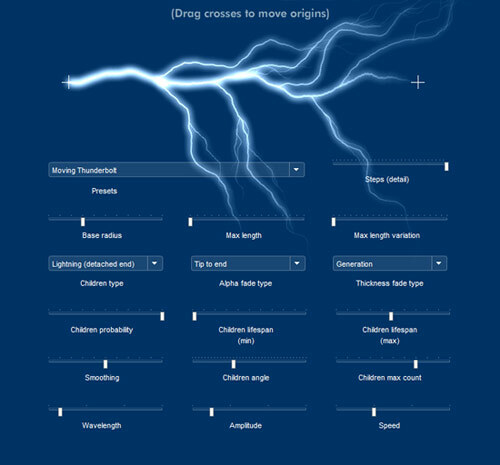 As instance if you set a childrenMaxCount = 6 to the main Lightning instance it will have a maximum of 6 direct children. Its children will have a childrenMaxCount value which depends on the main instance childrenMaxCount and childrenMaxCountDecay. So if you set childrenMaxCount = 6 and childrenMaxCountDecay = .5 the children of the main instance will have childrenMaxCount = 3. If you set childrenMaxCount = 6 and childrenMaxCountDecay = 0 the children of the main instance will have childrenMaxCount = 6 (no decay). This value can be very useful to optimize the speed of execution cause smaller branches don’t need many children or many steps of detail. Ok, I’m too tired to write more. I’ll publish some documentation in the next days. Feel free to ask everything question you can have in the comments, and as usual if you like this stuff scream it in the comments! Demos’ code after the break. Waiting for your comments I will surf through the website of fatcow and see if they have any good hosting plans. hey! that looks like the kind of code i write! Wow, it’s great, I loved the example with fingers Would be nice to add some synchronised sound fx (generated as well), wondering how difficult it would be? Amazing effect!! It has way more features than I’d been guessing about too. Really good Panta, I can’t wait to experiement with your well organised code. Best lightning effect ever!! Many thanks! Very well done. I downloaded the classes and I’ll give it a very good look, but before I do it, I have a question: are you drawing it to a BitmapData object? Wow…great to see an awesome AS3 blog! Loved the lightning! Sweet lightning!!! Came in perfect for a project I’m working on. I’ll send a link once it’s working. Nice effect. Thank you for sharing. Anyone have some good sound for this? wonderful. it’s a great work! omg it’s damn cool, thanks for sharing! thank you for sharing your source code! Wow! Very nice application, and nice implementation too!! but i cant get the demo’s to work..
i would love to use this for my next short movie. hi Paul, it’s not about the fla. It contains only the code snippet I posted to import and instance the main class. Did you download and imported the class? Could you post any error you receive from the compiler? ok. for example demo 2. i make a fla, add a document class, copy your demo code in there. i make fingers, dot1, dot2 movieclip symbols. add them to the stage even. then i run it. and i get errors regarding events and filters, so i import those. but then i get other errors. just one hopeless mess i get myself in. i must be missing something silly. you probably have an easy way to do it. but i cant figure it out. No problem at all. Could you up your fla somewhere to let me have a look? finally i did get it to work. ^^ this is my code (stripped down to a minimum) in the document class. sorry to spam your blog with it. but i’m still wondering how you do it. it should be possible to copy/paste your demo-code and have it workable, right? how did you do that can you publish a tutorial step by step please i just need it. awesome that’s very cool, it make me excited.i had copied your codes to flex builder and run it certainly change code littlely, i am researching your code,but i don’t understand some logic,please comment its logic the following is i dont understand, thank your for sharing your code. There are two displacements to achieve the effect a small one (every var beginning with “s” and a big one “b”). /* small offset is calculated by getting pixel value from the small perlinNoise bitmapData (sbd) – medium grey (0×808080) so the value doesn’t range from 0 to 0xffffff but from -0×808080 to +0×808080 the normalized to -1 to +1 (dividing by 0xffffff) and multiplied for the length of the lightning (so is always proportioned when scaling it) and multiplied for the (fixed) multiplier (multi2). // do the same with the big offset except from that the big one is ruled by the amplitude parameter and not fixed. // finally the target X of the segment to draw is calculated starting from the beginning (startX) + the step length (dx/(steps-1) * i (and this would lead to a straight very normal line) the the small X offset and the big X offset are added to make the actual lightning. awesome, it may be copy to use after some editing. I was looking for a way to create a background animation that consists of morphing lines that didn’t hammer a viewer’s CPU. This looks the part. The effect I’m after is here, but without the macro variations, you’ve probably seen it before in abstract vector backgrounds (http://www.shutterstock.com/results.mhtml#photo_id=39720274 for example), almost parallel lines that bend and move like a ribbon. Without waffling on, what book’s would you recommend as reference for this kind of work? Are there any that you’d recommend? Especially for a Maths monkey. I’m going to try and pick at this to get the solution I want (before I have a mental break down and do another tween animation lol). Most all thanks for the inspiration, it’s a real find when you discover someone with massive talent willing to share their knowledge and experiences. If it is a background animation, and you don’t want to hammer the CPU, you should move a single line with the kin of smooth movement you want, and draw it to a bitmap at everyframe, then darken the bitmap a little at every frame so the old lines progressively disappears. For the movement I could suggest to have a 1px*height px bitmapdata with a slowly moving perlinNoise. Then you should read all the pixels (or better get the vector) and use those values to draw your line. About the book, I am sorry since I an not the one who reads a lot of books, I learned by dashing my head against the wall until it works , sometimes I look for some math articles online (understanding a very small percentage of them ). I just bought it yesterday super discounted, not looked yet, but it seems promising. Thanks a lot for your appreciations. When I’m done unpicking what you’ve created and (if) I manage to get anything up and running (before I’m taken away by men in white coats) I’ll definitely drop you a line. Perfect! Just perfect! Thank you! i tried to convert this to flex 3, but i can’t add the Lightning-Objekt to the stage. when i try “Application.application.addChild(l1);” i get an UIComponent-exception. can anybody help me please!? You cannot simply add a Sprite to the stage, wrap it into a UIComponent. Thanks for share your code,They’re really cool,and this’s a piece of news come form Chinese friend.I hope we will be a good friend. Hi really rally great stuff. I am not so good in Flash. Is it possible to get the FLA File from the Demo 3 ?? First of all I want to say GREAT WORK ! I wanted to play a little with your results but I after downloaded the AS I don’t know what to create or what to do to see it and play with it. THIS IS SO AWESOME AND I JUST WANT TO LET YOU KNOW THAT I’M SCREAMING ABOUT IT IN THE COMMENTS YEAH W00T W00T CHICKEN FINGERS RANDOMNESS!!!!!!!!!!!!!!!!!!!!!!!!!!!!!!!!!!!!! WOW!!! THANK YOU VERY MUCH FOR SHARING!!! Just ran across this in my searches for cool effects. I love the effect and am thinking of good use for it on the redesign of my site that’s due to be done mid April. This can be overlaid onto any image? This is really cool. What a great affect. I will have to show a relative that does experiments with electricity. He will get a kick out of it. To Chris from NI: nice application of Panta’s efforts. If you’re associated with NI, I’m sure you appreciated all the controls. To Panta: I’m very unacquainted with all of this code, but I can’t help but leave big nose and hand prints on your site over this effect. Thanks for the show. Demo 2 shows how long the randomness of the lightening is sustained. I guess if I wished long enough and hard enough, I could get creative this way. You live in another world from the rest of us, helping to indistinguishably weld reality with virtuality . Can it be used commercial for free? Please if any one can help me use that .as files. How to use them ? Where the files should be copied ? Greetings, I’m from Spain, I just wanted to say I find a great class and that I am using one of my projects as lightning gun. Really nice work. I’m looking at your code now. I feel like it needs to be a little more “out of the box”, if you know what I mean. 1. I recommend a class in the package that would encapsulate the updating. This can be done via Event.ADDED_TO_STAGE / REMOVED_FROM_STAGE to detect if it is possible to add the Event.ENTER_FRAME, and when that event should be cleaned up. 2. I like your presets from the 3rd example, why not have a package ‘presets’ that can be instantiated straight away? If I end up doing this myself, I’ll post the result here for your consideration. Here’s an extention of the Lightning class that encapsulates the update functionality, the glow and the very useful setStart() and setEnd(). You can pass the stage, a point or a display object to these to tell it how the lightning should attach. If you pass the stage it will attach to the mouse. great code and effect, really is awesome! im pretty new to as, im just trying to assign this class to a movie clip and im having trouble, i just need the lightning to show staticly on the stage from two points , any thoughts? You can. Just send me a link to the game when it’s published. Yo. Is the download still up to date? I’m not even that great at AS2, but I’m hoping to be able to incorporate this gorgeous lightning effect into a project I’m working on. Still trying to figure out AS3 and I can’t seem to get this thing working. Am I missing anything? ….nevermind. I’m slowly figuring it out. Thank you so much for providing this code! Hello Pierluigi and all of your fans !!!! I am from Spain. I am studying game designer, but I am still a newcomer in this. Also thank to Gabriel because without his extension I think I wouldn’t have been able to use this amazing class. Awesome class!! seriously, very good looking lighting. Hello ! This effect is awsome and I used it in my video game “Claytus tower defense”. Thanks, your job is amazing !